[M]otherboard: A concise, easy to read, positively-phrased list of your most important birth preferences (a graphical “birth plan”). Available to download on any device as part of all parent memberships. 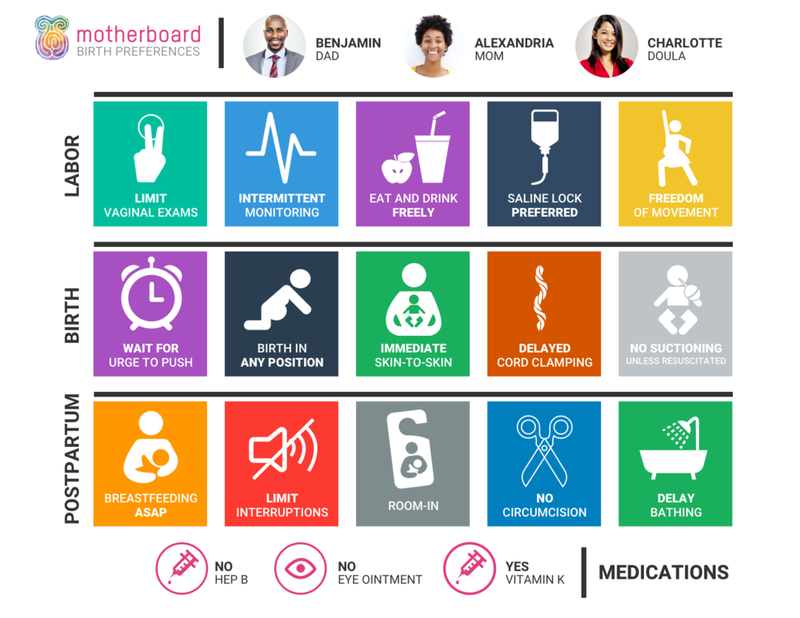 Collaboration with Birth Team: Give you birth team access to your [M]otherboard. Included with all parent memberships. Private Prenatal Community: Access to private Slack group to communicate with other Motherboard parents. Available with select parent memberships. Private Prenatal Consults: Private, online, video consultations with a birth professional. Included with select parent memberships. Private Professionals Group: Access to private Slack group to communicate and collaborate with other Motherboard professionals. Includes professional development education. Available with professional memberships. Motherboard Referral List: Motherboard partners listed prominently on website. Available with professional memberships. Triple Aim: Motherboard’s philosophy to continuing professional development. Often birth professionals get certified and then do not know where to go from there. Motherboard strives to help them succeed by focusing on continuing education of the head, heart and business sustainability. Available with professional memberships. A detailed breakdown of Parent options and pricing can be found here. A detailed breakdown of Professional memberships can be found here.